Grenade's Rapid Dispersal Capsule technology ensures fast delivery of AT4's high-quality nutraceutical payload into your body. AT4 has been developed to transform your body’s anabolic environment. 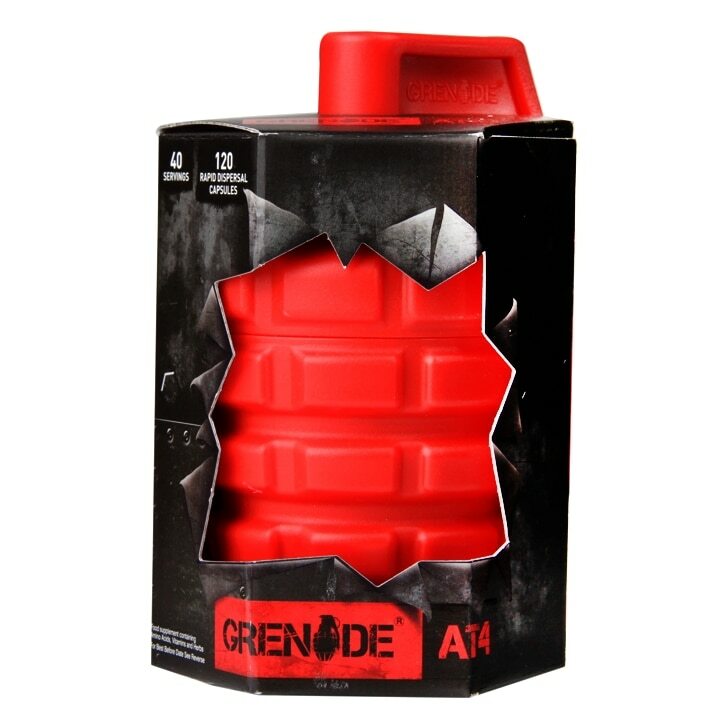 Grenade AT4 capsules are needed to achieve maximum strength and muscle mass as hitting the weights alone is not enough. You must be 18 years or older to purchase this product. Take 1 serving (3 capsules), twice daily - 30 minutes prior to breakfast and 30 minutes prior to lunch OR Take 2 servings (6 capsules) first thing in the morning, 30 minutes prior to breakfast. Do not exceed 6 capsules per day. Cycle 5 days on and 2 days off. After a 8 week cycle of AT4, take 4 weeks off before running another cycle. D-Aspartic Calcium Chelate, Fenurex™ Fenugreek, Passiflora Caerulea, Vitamin D3 (As Cholealciferol), Boron (As Boric Acid), Microcrystalline Cellulose, Bulking Agent (Magnesium Stearate), Gelatin, Water, Colours (Titanium Dioxide, Beetroot Red) Capsules Certified Halal and Kosher. Not suitable for Vegetarians. Food supplements should not be used as a substitute for a balanced diet and/or healthy lifestyle. This product is NOT intended for use by females and has not been tested in women. It is exclusively for use by men over the age of 18 only. If you have any health condition or are on any medication, consult your healthcare practitioner before using this product. If you experience any negative effects, discontinue use of the product immediately. This product is intended for use by adults. Store in a cool, dry place, out of the reach of children. DO NOT use if the seal or container appears to have been compromised. Beetroot Red may have an adverse effect on activity and attention in children. Note for tested athletes; Please consult your federation prior to use. Grenade AT4 Capsules is rated 5.0 out of 5 by 2.